Clarisonic have released a new deep pore cleansing brush head, designed to be used on oily skin to target large pores or hard to reach areas of the face, such as around the nose. I recently visited a dermatologist who prescribed me retin-a for dilated pores but as I’m currently trialling the Philips Reaura, there’s no way I can use something like retin-a at the same time and I’m looking for an alternative. So, how is this new brush head going to help with large pores? Well, if you’ve genetically inherited enlarged pores… it’s not. But if your pores are dilated because they’re clogged with deep-seated blackheads and other such gunk, then this could help clear the debris more effectively than traditional cleansing methods, or indeed the other brushes available for the device. Now, I’m going to preface this by saying that I’ve only tried it once (because I’m hyper-aware of over-exfoliating whilst using the Philips Reaura) and I’m not commenting on it’s efficacy, because with only one use, I’m in no position to judge. I will say that it’s remarkably gentle on my skin, I was expecting something far more abrasive-feeling considering I was previously used to the ‘sensitive’ brush head. I think this is going to be fine… infact, it feels softer than the ‘normal’ brush head that I originally swapped out when I first used my Clarisonic. When I’m finished with the Reaura trial, I’ll be putting this to the test before going down the retin-a route, so you can be sure that I’ll be back with a full review in a couple of months time. 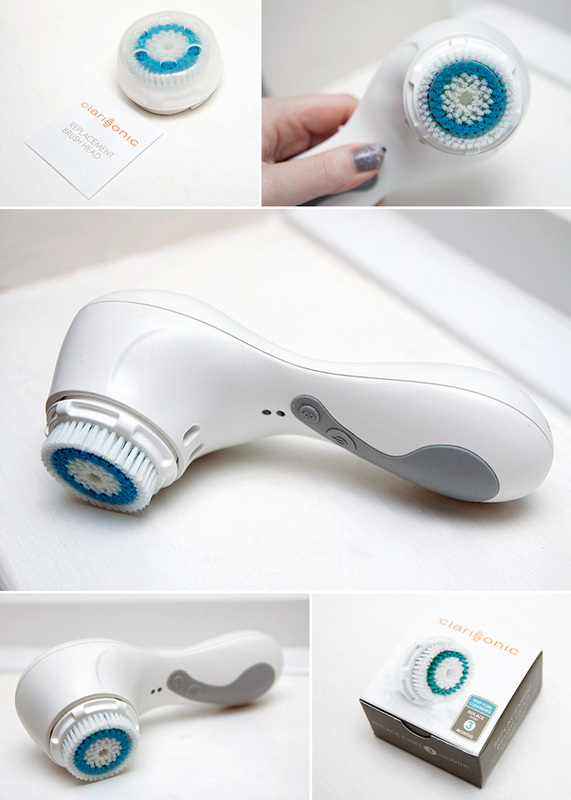 Until then, check out this fantastic Clarisonic Mia review from Product Pixie, she who inspired me to pull the Clarisonic out of the cupboard again in the first place! Also, just a quick brush head tip for you – I mostly use my Clarisonic after removing my makeup but not always, which means that my brush head isn’t as white as it used to be despite regular cleaning. I tried soaking one overnight in a dilute mixture of Napisan and hot water, it came out sparkling. Obviously, if you try this… make sure that you’ve rinsed, rinsed, and rinsed again – you don’t want Napisan on your face. The Clarisonic Deep Pore Brush Head is currently available from Space NK instore and online, priced at £21 before a nationwide release next month. I use this brush head and found it works wonders for my large pores so you may well be surprised after you’ve used it for a little while. I love my Clarisonic! Off topic, Google ASAP Vitamin A serum. Salon strength and worth a go before you try Retin A.
I really want to try the Clarisonic but I have heard a few different reviews and I don’t want to use anything too harsh on my skin for fear of over-exfoliating. Looking forward to hearing your full review!